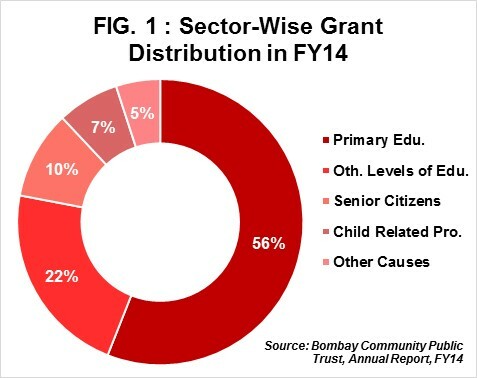 Bombay Community Public Trust (BCPT) is the only Community Foundation (CF) in Mumbai. The main purpose of a CF is to serve the local needs of communities and at the same time cultivate the culture of organized philanthropy. Theoretically, CFs are not required to conduct programs of its own, but build endowment funds over a period of time by raising funds from donors. The income earned from these funds is used for community development. CF is a novel concept in India, but is a commonly used platform by donors in the developed countries. (Visit HYNGO’s Blog to learn more about CFs). BCPT raises funds from wealthy individuals and family trusts in the city and manages these funds on their behalf. These funds are then, in a disciplined manner, disbursed to only Mumbai-based non-profits working in the areas of health, education, environment and for other development. BCPT supports non-profits working with beneficiaries of all age group; from children to senior citizens. It supports programs designed for women empowerment too. It also conducts various programs on capacity building for its implementing partners (recipients of grants from BCPT). In past 22 years, BCPT has supported 627 projects for over 200 non-profits in Mumbai. In the past five years, average grants sanctioned per project was Rs0.8mn each. Refer Fig. 2 to view BCPT’s YoY average spend per project. So far, BCPT has supported 108 NGOs working with children, 43 supporting community development including the environment, 29 NGOs empowering girl children and women, 29 NGOs providing health and medical support and 20 NGOs supporting senior citizens. There are organisations which have received support from BCPT since 1995 and continue to receive funds even today. Average time horizon for supporting each NGO is 2-3 years. 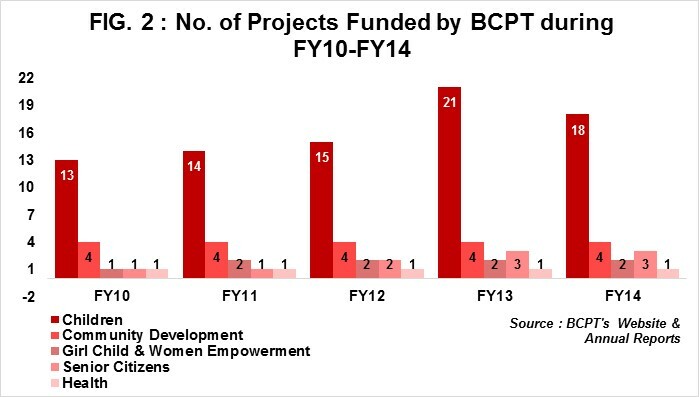 During FY14, BCPT funded 29 projects, majority of these projects were children centric (18). Average support given to each NGO in FY14 was Rs0.6mn. 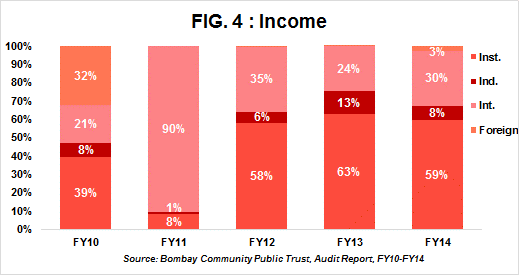 BCPT’s total income in FY14 declined by 18% YoY owing to significant drop of 49% and 22% YoY in contributions received from individual and institutional donors respectively. Interest income has remained the second largest revenue contributor in the past three years. Average income earned as interest during FY12-FY14 was Rs5mn i.e. 30% of total income. Investments have consistently remained in the range of 96%-98% on total assets between FY10-FY14. 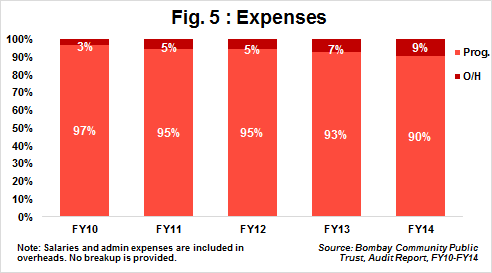 On an average, about 93% of total expenses was sanctioned as grants to non-profits during FY10-FY14. BCPT’s social worker visits the project site and submits a proposal to the Panel of Advisors and the Board of Trustees. In FY14, 90% of total expenses was sanctioned as grants across 29 projects. During FY14, a new Donor-Advised fund was introduced by BCPT, where the donor participates in both; raising funds and the decision making process. One fund (‘Mumbai Connexions’) has been added by a group of British women living in Mumbai. E-teach was the first donor-advised fund launched by BCPT. BCPT has a healthy Balance Sheet with Trust Corpus of Rs33mn and Rs13.8mn of Earmarked Corpus. Earmarked funds, which includes various endowment funds and donations, received Rs8mn in FY14 as against Rs9.5mn in FY13. BCPT posted a negative 5-year income CAGR of 5% for the period FY10-FY14. 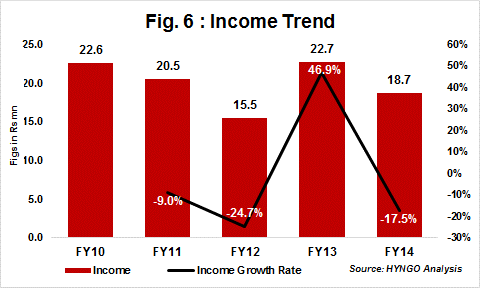 The YoY drop in income in FY12 and FY14 dragged down the income CAGR. The decline in FY12 was mainly due to significant YoY decline of 239% in interest income. Self Sufficiency Ratio (SSR) which measures an organization’s ability to meet operating expenses from its own income sources like donations from individuals, service charges and interest income was only 40% at the end of FY14. This suggests that BCPT should increase its fund size manifold to an extent where income from interest exceeds donations from external sources. BCPT receives donations from established and committed donors like Sir Dorabji Tata Trust, Tech Mahindra Foundation, HDFC Ltd., Bhartiya Vidya Bhavan and Pirojsha Godrej Foundation. Besides these, there are a handful of individuals supporting BCPT on an annual basis. Small team size. Although, this has helped BCPT to keep their overall staff cost low, it is essential that BCPT inducts one or two executives dedicated to promote the benefits of parking money with community foundations. Limited base of committed donors. This could be mitigated by hiring executives responsible for fund raising and promoting organized philanthropy. BCPT was founded in 1991 by like-minded Mumbaikars who strongly believed in the concept of organized philanthropy. Ms. Harsha Parekh, an eminent personality in the philanthropy domain has been spearheading the initiative of promoting this concept since inception of BCPT. BCPT’s Board comprises of 12 trustees, including Ms. Parekh. The Board of trustees meets once every quarter to review the performance of BCPT and its implementing partners. In FY14, the Board met only twice. BCPT has also inducted a Panel of Advisors consisting nine members. Appointed members are from the development sector and hold senior positions in their respective organisations. All funding proposals are circulated to the Panel of Advisors and the Trustees before announcing any sanctions. The Panel of Advisors meets once every month. None of the trustees or advisors are related to each other. BCPT publishes an annual report which elucidates information on every implementing partner supported by BCPT in the year under review. A semi-annual update report is sent to BCPT donors. Field visits are conducted for donors, if required. BCPT had collaborated with HYNGO to conduct a public lecture on 'The Community Foundation Advantage' to celebrate 100 years of CFs and a unique institution of community philanthropy. BCPT is a transparent, well-managed and an ethically run organisation.